iProtect flashlights by True Utility are compact pocket flashlights for a nice price. With models from 100 - 280 Lumen, also with zoom function. True Utility® is a British design company that specialises in stainless steel gifts, gadgets, and key-ring accessories. Creating clever things for key-rings, True Utility provides people with minimalist and practical solutions to everyday problems. Knives, multi-tools, openers, lighters, flashlight scissors. All very compact and nice priced. iProtect flashlights by True Utility Il y a 6 produits. 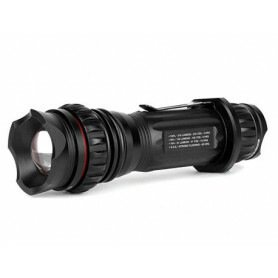 The Iprotec Chameleon is a compact tactical LED with one for button white, red and green light. A high power LED that outputs 220 lumens (white LED) and 4 x ZOOM. A high power LED that outputs 250 lumens (white LED) and 6 x ZOOM. A high power LED that outputs 280 lumens (white LED).